Duncan McArthur (1772-1840) was Ohio's twelfth governor, serving from 1830 to 1832. His estate, Fruit Hill, was located near Chillicothe. Duncan McArthur, Ohio's eleventh governor, was born in New York on January 14, 1772. His father, John MacArthur (Duncan chose to spell his name differently than his father), had immigrated to the British colony from Scotland sometime after 1746. While McArthur was still a child, his father moved the family to western Pennsylvania, which was considered part of the frontier at that time. The oldest of seven children, McArthur's life as a child on the frontier was quite difficult. Because his family was poor and had to struggle to survive, he had to work hard from a very young age. Eventually he found work as a hired hand on neighboring farms to add to the family's income. McArthur's responsibilities kept him from obtaining a formal education, although he did teach himself to read by the time that he was a teenager. His lack of formal education sets him apart from other early Ohio governors, many of whom had college educations. In 1790, at the age of eighteen, McArthur joined the so-called "Pennsylvania volunteers." He participated in General Josiah Harmar's expedition against American Indian peoples in the Northwest Territory. In this and other military adventures, McArthur gained a reputation for courageous leadership. By 1792, he was living in Maysville, Kentucky, and working in a local salt works. The following year he obtained a position with Nathaniel Massie on a surveying expedition into the Northwest Territory. He worked once again with Massie in 1796 to lay out a new town called Chillicothe. At this point, McArthur was able to obtain a tract of land near Chillicothe and moved to the area with his new bride, Nancy McDonald. McArthur was able to make his fortune in land speculation in the Northwest Territory and then the new state of Ohio, using some of his money to build an elaborate home on his country estate. Called "Fruit Hill," the house contained not only local stone and wood but also many luxury items brought by river from the East, including brass fixtures, glass, and many other furnishings. Like fellow Chillicothe resident Thomas Worthington, McArthur was known for his hospitality at Fruit Hill. In 1805, McArthur became involved in politics for the first time. He was elected to the Ohio Senate and, in 1809, became Speaker of the Senate. McArthur quickly became associated with a number of controversial issues within state government. He allied himself with other members of the Democratic-Republican Party to impeach state Supreme Court justices George Tod and Calvin Pease. He supported moving the state capital to Columbus, and opposed the Tammany Societies springing up in Ohio. McArthur faced a difficult reelection in 1811. Accused of cheating at cards and drinking too much, he was still successfully re-elected. In addition to his political service, McArthur also joined the state militia as a colonel. He soon was promoted to major general. Commanding a militia unit under General William Hull during the War of 1812, he was captured and then paroled by the British at Detroit. After his parole, McArthur resigned from the militia and joined the United States army as a brigadier general under the leadership of General William Henry Harrison. When Harrison resigned in 1814, McArthur took command of the army in the Northwest. After the War of 1812 ended, McArthur returned to political life, and was elected to the state legislature once again in 1815. 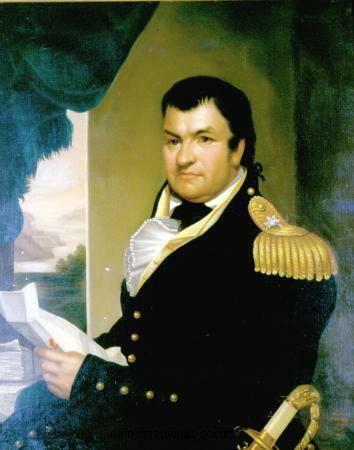 He was involved in negotiating treaties with American Indian nations in Ohio, including the Treaty of Maumee Rapids in 1817 and the Treaty of St. Mary's in 1818. In 1819, McArthur failed to win reelection to the Ohio House of Representatives, in part because he opposed taxation of the National Bank of the United States. He served as a director of the National Bank's branch at Chillicothe. Duncan McArthur returned to politics in 1821, serving in the state Senate from 1821 to 1823. Between 1823 and 1825, McArthur represented Ohio in Congress but did not win reelection at the end of his term. He was a member of the Ohio House of Representatives from 1826 to 1827 and served again in the Ohio Senate from 1829 to 1830. In 1830, McArthur ran for governor against Robert Lucas, winning by a narrow margin of only 482 votes. In comparison to some of his predecessors, McArthur had a fairly uneventful term as governor, with no significant controversies. This was a time of economic growth in Ohio. Construction on the Ohio and Erie Canal was completed, and other canals were begun as well. The National Road was also under construction and made it as far as Zanesville by the time that McArthur left office. The state legislature granted a number of charters to companies to build railroads, although none were actually started until after McArthur's term ended. McArthur chose not to run for reelection as governor. He ran instead running for another term in the legislature in 1832. After he was defeated by William Allen, McArthur retired to his home at Fruit Hill, where he lived until his death on April 29, 1839. Cayton, Andrew R.L. Frontier Republic: Ideology and Politics in the Ohio Country, 1780-1825. Kent, Ohio: Kent State University Press, 1986. McDonald, John. Biographical Sketches of General Nathaniel Massie, General Duncan McArthur, Captain William Wells and General Simon Kenton: Who were Early Settlers in the Western Country. Cincinnati, OH: E. Morgan and Son, 1838. Weisenburger, Francis P. The Passing of the Frontier: 1825-1850. Columbus: Ohio State Archaeological and Historical Society, 1941.